There is a lot to be said for the personal benefits of buying healthy. A selection of fresh, locally grown fruit and veg can work wonders for your well being but it can also be great for the environment. This, if you think about things in the long run, can also be good for you. There are the simple and obvious things you can do to help make the world a better place, buying fair trade products is one. But if you’re interested in making your lifestyle greener there are a number of small, almost insignificant changes you may not have thought of. You can look for ways to reduce and recycle in almost any regular activity, but grocery shopping is one of the easiest. By making small changes and eco-friendly purchasing choices, your shopping routine can be an easy way to reduce your impact on the environment. This can help in a number of different ways. When you jump in the car to nip to the supermarket, you impact the environment in more ways than you might imagine. Often, it can be more convenient to order shopping online while sitting on the rather than heading back out again to the supermarket. New research shows it’s also much more environmentally friendly to leave the car parked and opt for groceries delivered to your doorstep. 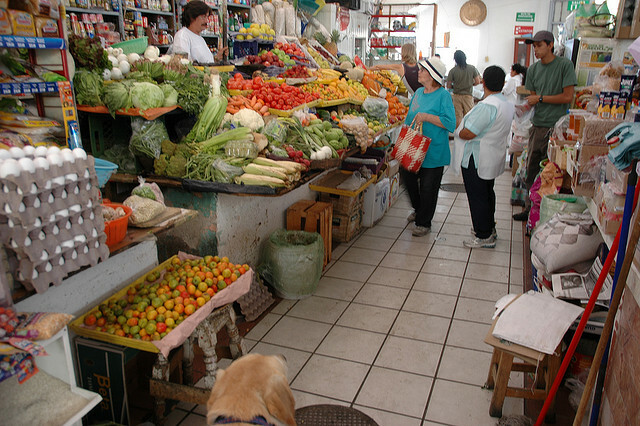 Shopping local should also include buying produce grown nearby. Many will tell you that local food tastes better, which may or may not be true. It is also up for debate whether or not food that has not had to travel as far has higher nutritional value because of its freshness. But with food from further away, details about pesticides, land use, and working conditions are hard to come by. You will also know that it has not had to travel for miles, cutting down on emissions and you will be supporting a local farmer. Items such as strawberries and asparagus have to be transported great distances to reach your table in the winter. Because of this, seasonal foods tend to be cheapest – and, when thinking about your green credentials, reducing air and ground transport for food cuts our use of fossil fuels and alleviates air pollution. If it’s a toss-up between one or another punnet of grapes – go for the one you know is best for the planet as different materials are easier to recycle than others. For instance, all paper and cardboard can be recycled whereas with certain types of plastic it can be more difficult. It is very important to make sure you don’t just throw them away along with your regular rubbish. If you have to use plastic, such as bags, make sure you’re recycling them. Take a plastic bag back to the shop with you, save having to buy or take another one. Also look at buying food that is not individually packaged. Aim for loose items to cut down on unnecessary packaging. A lot of the time a pack of, for instance, onions can seem like they are half empty. In this case, go for the loose onions. Being frugal protects your pocket and the environment. Food waste disposed of incorrectly can be a nightmare when it comes to landfill. Around 40 per cent of food produced in Europe is wasted. Methane, a greenhouse gas estimated to be 20 times worse for the environment that carbon dioxide, is created by rotting food and emitted from landfills as food rots. Avoid this by buying less and disposing of everything you don’t use properly. Free range animals raised for meat also put less strain on the ground where they’re raised and do not require as much in the way of antibiotics. Animal waste that is free of antibiotics and chemicals is friendlier to groundwater, plants and wildlife.